All bins/recycling containers to be presented by 6.00am for collection. From the 1st April 2017, Lisburn & Castlereagh City householders must use their brown bin for food waste. 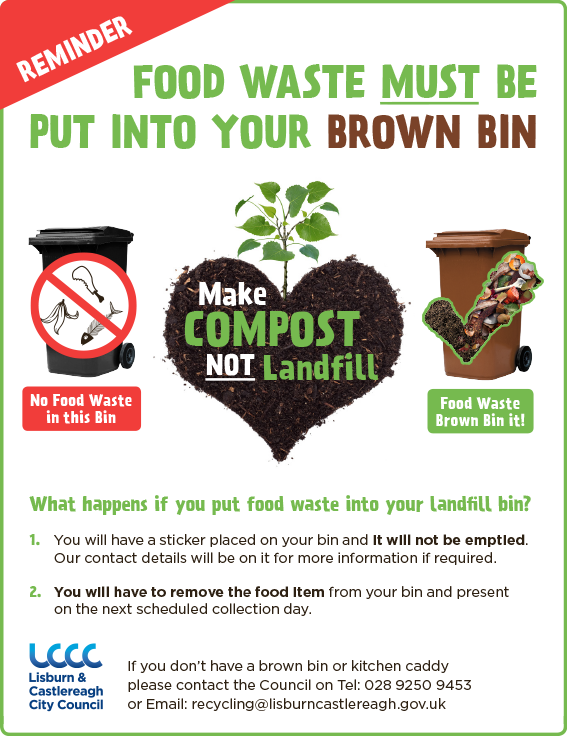 Landfill bins found to contain food waste from 1st May 2017 will have a notice applied to their bin informing them that it should go in the brown bin. The Council provides a free food waste caddy and liners for convenient recycling of food waste in the household. Once the caddy is 3/4 full, tie the liner, remove from caddy and place in your brown bin. Additional caddy liners can be requested by attaching the red tag to the handle of your brown bin on the designated collection day. Council staff will then supply a replacement roll of liners as required. For further information on food waste recycling, click here. If you don’t have a brown bin, please email recycling@lisburncastlereagh.gov.uk or call 028 9250 9453.